Meltric Switch-rated Plugs and Receptacles DSN Decontactor Series products are switch and hp rated for quick, safe equipment changeouts. DSN’s are ideal for wet environments since they offer Type 4X watertightness as soon as the plug is latched to the receptacle or as soon as the receptacle lid is closed. 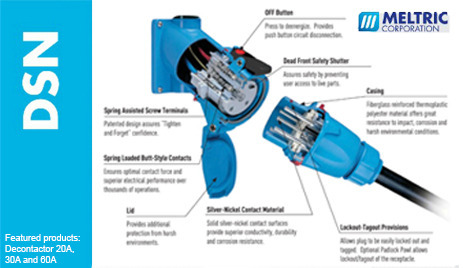 The DSN20 – Decontactor 20A has three main options Mushroom Pawl, Padlock Pawl and Close Lid Configuration. Short Circuit Rating 100kA Close & Withstand Testing was performed with RK1 current limiting fuses sized at 400% of the highest full load motor ampacity associated with the devices hp rating. Short Circuit Rating 100kA Close & Withstand Testing was performed with 225A RK1 non-time delay Mersen fuses. 10kA Close & Withstand Testing was performed with 400A RK1 non-time delay Mersen fuses. Download the Meltric Switch-rated Plugs and Receptacles DSN Decontactor Series spec sheet below or call 714.835.6211 for more information.